We have a Private Client update this week: I definitely recommend that you read this if nothing else. However, we of course have our pick of interesting cases, and if you like VAT, then we are continuing our detailed look at land and property. 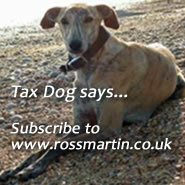 Not thinking about tax (for a change!) there is ongoing debate about the state of our local high streets. I remember when new supermarket chains were blamed for killing off local grocers, then came the 'out of town shopping experience'. I suppose we should really blame that on town planners, however the best way to store and display a large range of goods is going to be in an industrial sized unit and the best way to get your shoppers there is to have a car park and a cafe. Then of course we had outcry over the large influx of non-business rate paying charity shops taking up the prime retail spots, and an unpresidented rise of coffee shops, but we still had department stores, although their business models dictate that their concessions are more likely at the luxury end of the scale. Now we have a lot of online retailers. Unless you need a coffee, you can do most things from home (interent access permitting). I think that in truth, for many small towns, the concept of a local high street with a range of retailers died many years ago. We are consumers: we want choice. We are business owners: we want low overheads and to maximise our ability to display our wares. Online selling whether goods or services makes perfect sense. In terms of the high street, we always want to go out for meals and to be sociable, why not have a different kind of re-think how we use the space that was the high street? You can comment on anything in our SME news section, so please do. Don't forget to swot up on our unique Finance Bill 2018 rolling Tax Planner, this gives you instant CPD, summarising all the new developments in tax across the SME spectrum for the 2018/19 tax year. Exciting new tax tools are on their way so stay with us. The European Commission have approved the continued use of the UK's VAT fuel scale charge adjustment for private use of cars until 31 December 2020. NEW: a round up of the latest developments in tax for private clients, covering income tax, CGT and IHT. NEW: Our new guide to mutual trading and members clubs explains how to deal with these types of clients and what the tax pitfalls may be. UPDATE: instant CPD we track all the key developments for you. UPDATE: more information on how to qualify for this 10% CGT rate. What is the difference between Enterpreneurs' Relief and Investors' Relief? How do they compare to investments in Seed Enterprise Investment Scheme (SEIS) and Enterprise Investment Scheme (EIS)? There is also a special relief available for Non-domiciled individuals called Business Investment Relief this allows tax-free remittances for investment purposes. UPDATE: For what to do if you have missed the settlement deadline, and further clarification on the loan charge, how to deal with the trust, and on what happens on death. In William Reeves v HMRC  UKUT 293, the Upper Tribunal (UT) found that a non-resident taxpayer can gift a UK trading asset to a UK company he owns and claim holdover relief. In Daarasp LLP And Betex LLP v HMRC  TC06718 the First Tier tribunal refused £43million of capital allowance claims for software licences; the LLPs were not trading and even if they had been, the expenditure had not been incurred in the relevant accounting period. In Hastings Insurance Services v HMRC  TC06656 the FTT confirmed that the principle of open justice allows the public to access unpublished legal arguments used in a public Tribunal hearing even if you have no direct connection to the case. The European Commission has approved a proposal which will enable Member States to reduce the VAT rate applicable to e-books. In Richard Akester v HMRC  TC06711, the First-Tier Tribunal (FTT) determined that the taxpayer was not entitled to recover VAT under the DIY housebuilders scheme because at the time of the claim, the intention was to operate a rental business. In RPD Building Limited v HMRC  TC06740, the First-Tier Tribunal (FTT) denied VAT recovery on costs related to upgrading a car to a high performance racing car. NEW: a guide on VAT issues for construction, sale, lease, rent, and more of non-residential property. NEW: a guide on VAT issues for construction, conversion, sale, lease, rent, and more of property used for a relevant residential or relevant charitable purpose.